In some ways, Popeye Jones isn't your typical hockey dad. The 6-foot-8 former NBA player spent 11 seasons crashing the boards for six teams. But the lessons learned in his basketball career have helped his son Seth become one of the top prospects for the 2013 NHL Draft. Ironically, Seth Jones' hockey road began with his father's time as an NBA journeyman, playing primarily on teams that shared an arena with an NHL franchise. When Popeye Jones entered the NBA in 1993 with the Dallas Mavericks, he was bound to rub elbows with his NHL neighbors. "We were following the [Dallas] Stars when I was with the Mavericks. I did a charity event with [Mike] Modano and thought he was a nice guy," Popeye Jones, now an assistant coach for the Brooklyn Nets, told NHL.com. "So we went to a Stars game and we really fell in love with the sport. I started watching hockey and we adopted the Stars as our team." Raising three boys, Jones' appreciation for hockey only heightened when he was traded to the Toronto Raptors in 1996. But it was a chance meeting with an NHL legend in Denver that got Jones' sons involved in the sport. "I was playing for the Nuggets and I was working out at the Pepsi Center and I saw Joe Sakic. I said, 'Hey Joe,' and he had no idea who I was," Jones said of the Colorado Avalanche star. "I just said, 'My kids want to play hockey.' He turned and looked at me and said, 'From the look of you, your kids are going to be huge. They need skating lessons.'" From there, Jones' sons -- Justin, Seth and Caleb -- dove headfirst into hockey. Eldest son Justin (22 in November) became a close family friend of Patrick Roy's kids, and eventually played briefly at the University of Denver. 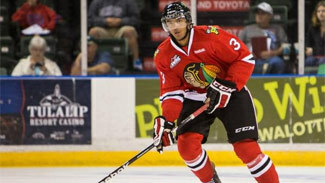 Middle son Seth, an 18-year-old defenseman for the Portland Winterhawks of the Western Hockey League, now stands at the top of every 2013 prospects list. Youngest son Caleb, 15, was selected by Portland in the third round of the 2012 WHL draft. He'll spend this season playing for the Dallas Stars bantam major team. Popeye, having experienced his own draft-day saga, has been happy to share some advice. "You just have to help your team win and not worry about the future," he said. "The future will take care of itself. It's hard for any kid not to think about it, because they're excited. When I was in college [Murray State], I was excited -- 'Oh, I get a chance to be drafted in the NBA.' I told [Seth], 'Keep your head down, keep on working. You do the things that have made you successful.'" Seth's first season in Portland was made more special by the presence of Caleb, who attended Winterhawks training camp. He wasn't there long before returning to Texas, but the camp gave the brothers an opportunity to renew their sibling rivalry, one that isn't confined to the ice. "The next best basketball player in the family next to my dad would be me. Without question. Hands down," the 6-foot-3 Seth Jones said. "My little brother may be taller than me, so I've got to watch out for him pretty soon. But right now I've got him." The rivalry likely will be set aside in June, when the Jones family attends the 2013 NHL Draft in Newark, N.J. Seth is expected to be one of the first two picks (along with Halifax Mooseheads forward Nathan MacKinnon), and Popeye is looking forward to the big moment. "I think what makes it even more special for me is I don't have to travel anywhere. It's at the Prudential Center. I live 20 minutes from the Prudential Center. That will be really fun," said Jones, who has no intention of stealing his son's spotlight. "It's his time. I think Seth is trying to carve his own way. I love that." By all appearances, Seth has demonstrated a physical and emotional maturity that will serve him well in the NHL. They're qualities inherited from both his parents [Popeye and his mom, Amy]. And if Seth is already looking out for his younger brother on the basketball court, it may not be long before he's watching for him out on the ice. 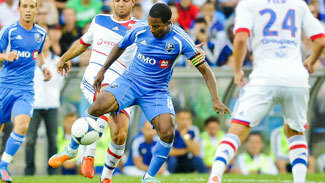 At 15 years old, Caleb still has time to develop his game with hopes of joining his brother in the pros. He's used to being asked about his dad in the NBA. Soon enough, he'll have to get used to being asked about his brother in the NHL. "Caleb goes to school in Dallas, and he said the coach was walking down the hall and said to him, 'I know who your dad is; do you want to come out for the basketball team?'" Popeye said. "He said, 'No, thank you. I'm a hockey player.'"